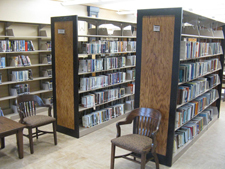 (2011) – Michiana Laminated Products, Inc. manufactured and installed end panels, canopy tops, children’s furniture, and motion tables. 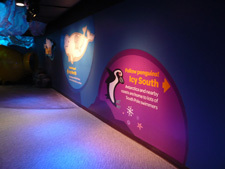 (2009 & 2010) – Michiana Laminated Products, Inc. manufactured and installed a number of graphical panels and displays utilizing d(HPL) graphics. 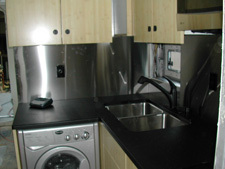 These panels were mounted to a number of different materials and features within the aquarium including columns and sliding doors. 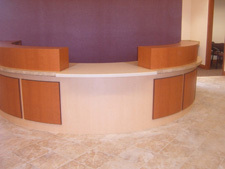 (2008) - Michiana Laminated Products, Inc. manufactured and installed a variety of cabinetry including a reception desk and teller line with Corian® writing surfaces, check desk, work surfaces, and panels. 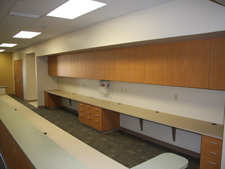 (2009) – Michiana Laminated Products, Inc. manufactured and installed 650 linear feet of upper and base cabinetry including reception desks, work surfaces and hardwood reception ledges. (2008) – In the early part of 2008 we were approached with the possibility of participating in a very interesting project involving a very interesting man by the name of Jay Shapiro. Jay had a dream of designing and building an overland vehicle to travel the world with his family with minimal impact on the environment.